PALMER — The teenagers accused in the November 2016 killing of 16-year-old David Grunwald partied in a shed near Palmer for days after the murder. That's according to videos and witness testimony Thursday in Palmer Superior Court from a 16-year-old girl who let them stay in the shed behind her house. Four of the teens smoked marijuana with Grunwald in a camper behind Erick Almandinger's home, then pistol-whipped him using Almandinger's heavy Ruger .40-caliber pistol, drove him to the Knik River and shot him once in the head, prosecutors say. Then they torched his 1995 Ford Bronco. 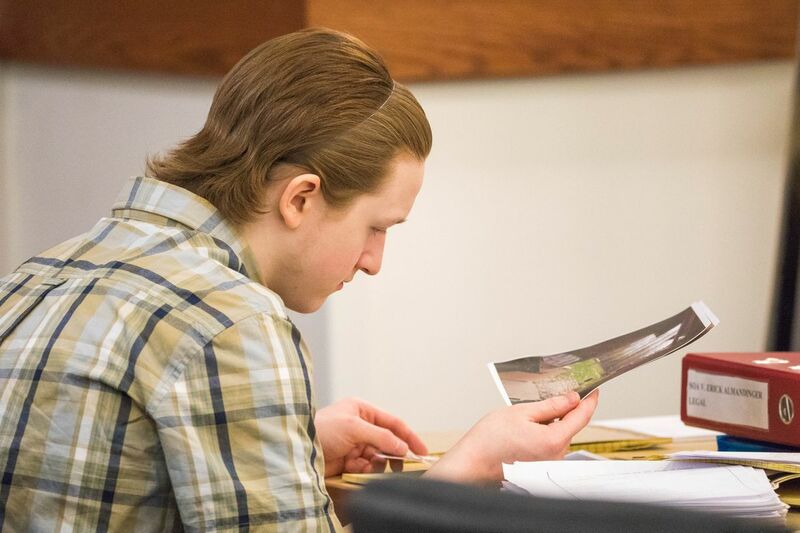 Almandinger, 18, is the first of four teens charged with killing him to stand trial. Another accused in the crime, Devin Peterson, took a plea deal on charges he hid weapons and gave the others gas cans to burn the Bronco. Witnesses on Thursday painted a picture of Almandinger and the others as a group of friends with little parental supervision, in and out of school and with easy access to drugs and alcohol. Grunwald was killed the night of Nov. 13, 2016, authorities say. 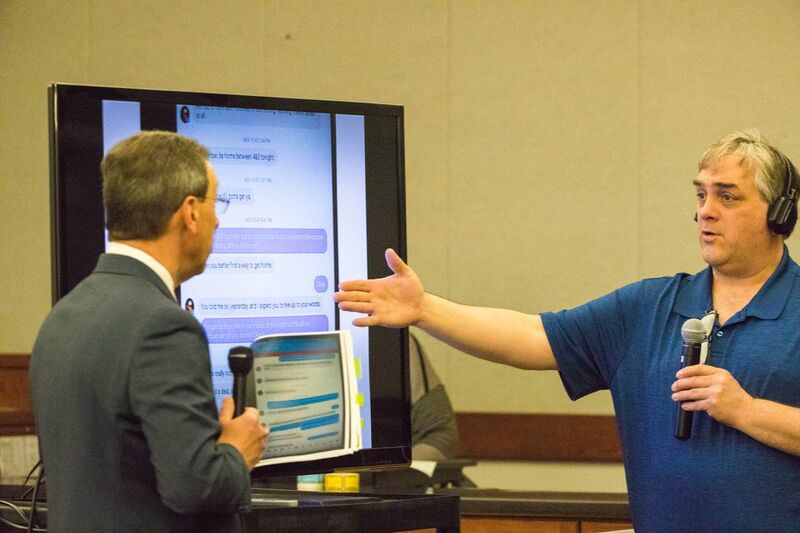 Almandinger messaged the girl with the shed just before 4 a.m. the next morning, she testified. The girl was dating one of the boys. She said she was staying with friends of her father's in a nice neighborhood and not going to school regularly. The Anchorage Daily News is not identifying her at the request of Superior Court Judge Gregory Heath. All five charged in the crime — Almandinger, Peterson, Brad Renfro, Austin Barrett and Dominic Johnson — ended up in the shed by the night of Nov. 14, the girl testified. Initially, it was just Almandinger, Renfro and Johnson. They were cold and hungry. They left and came back. Almandinger "brought a bunch of alcohol from his dad's house" as well as marijuana, she said. "They were just hanging out. Sitting, drinking and smoking. Hanging out like friends do." 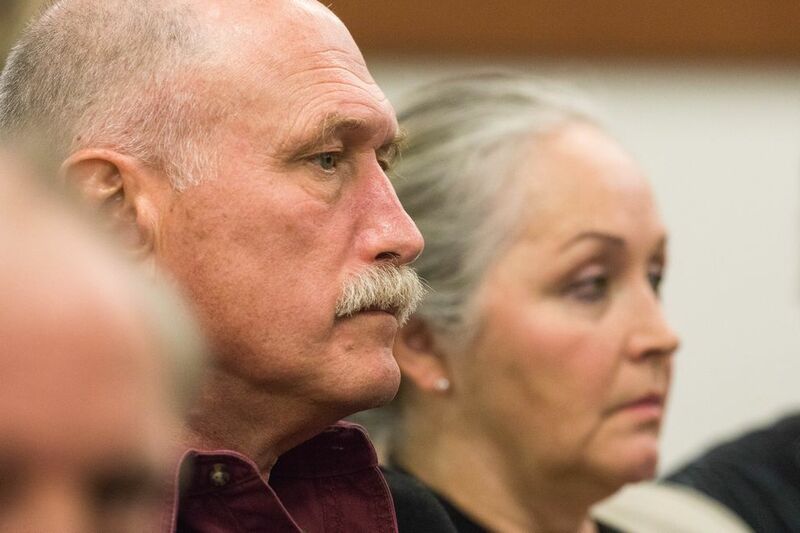 By then, Alaska State Troopers investigators had already gone to Almandinger's family home to talk with him, according to the original complaint in the case. He wasn't there. Prosecutors on Thursday played two videos the girl said were filmed in the shed. One shows Almandinger, looking wasted and laughing hysterically, wrestling with somebody while rap music plays, then making what looks like a gang sign. In the next, Almandinger looks dazed as a triangular stain spreads across the front of his jeans. Somebody asks if he's pissed himself. At some point, the girl said, she messaged Almandinger to keep it down because they were too loud. She also got angry at him and one of her girlfriends, who was "fooling around" with Almandinger in the shed and came in with hickies on her neck. "I got mad at them because I just didn't feel that was OK," she testified. Almandinger told her he'd found a place to stay Nov. 16. Alaska State Troopers ultimately rounded up the teens as they left Palmer's Valley Hotel in early December. Johnson offered to lead them to Grunwald's body. That day, Dec. 2, they arrested Almandinger. His father, Rodney, took the stand earlier Thursday. He said he was inside working on a stained-glass project for a client and didn't hear or see anything the night of the murder. He knew Erick wasn't in the house but didn't know where he was, Rodney Almandinger said. Almandinger testified Thursday that his first indication something might be wrong came when Grunwald's mother, Edie, called looking for her son. Edie Grunwald testified earlier in the week that she called when she heard David might be with Erick. But Rodney didn't know where David was — or Erick either, she said. Then, Grunwald said, she called the troopers and called Almandinger back to tell him. "I thought he'd be glad, as a concerned parent. His response wasn't quite what I expected," she said, repeating it: "'Aw, these kids are f—ed.'" Almandinger testified Thursday that he meant both Grunwald and his son would be in trouble once they turned up. Almandinger said he went to bed around 1 a.m. after trying unsuccessfully to reach Erick via Facebook Messenger. A response from his son came around 3 a.m. He read it to the jury: "Hey, I'm sorry I'm not with any David to be honest. I'm with some friends and I won't be home tonight, sorry. Maybe I will be at school tomorrow hopefully if I can get a ride." They talked sporadically back and forth, Almandinger testified, including when the torched Bronco turned up. His son continued to act like he didn't know anything. Erick came back to the house briefly on Nov. 14 with Johnson. He came home to stay on Nov. 16, he said.